Are You Having Problems With Your Pet? Fully qualified, with a Post Graduate Diploma in Companion Animal Behaviour from the University of Southampton, Tina's job is to provide you with the skills to overcome any problems you may be experiencing. This begins with taking a thorough case history at an initial consultation to discover the root cause of the problem. Then a practical behaviour modification programme using kind, fair and effective methods is implemented. A written report is compiled & forwarded to you, and progress is monitored either by telephone or by follow up consultations as required to offer continuous support for the next 4 weeks or longer. It is important to eliminate any physical condition which may be the cause of the behaviour problem before commencing behaviour therapy. As a professional behaviour counsellor, Tina needs to liaise closely with your vet, and a result, veterinary permission is always required BEFORE the initial consultation. 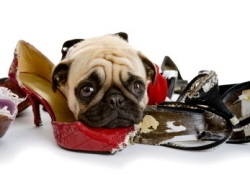 If you are an owner with a problem pet please call us to discuss the problems you are experiencing. If you are a veterinary surgeon & wish to refer a client to us for help, please send us an email detailing the problem and the health status of the pet at the last consultation, and attach a copy of the pet's case notes, we will then contact the client and report back to you after the consultation.